We are really proud of The Siding. 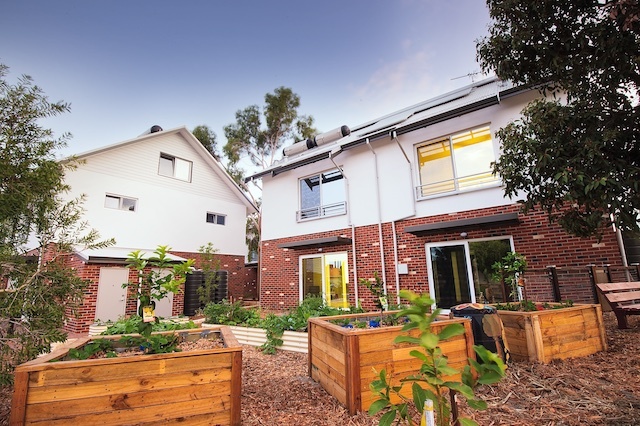 This small cluster of 7 residences has been built with the long term impact on the environment in mind and provide a comfortable and very attractive lifestyle. 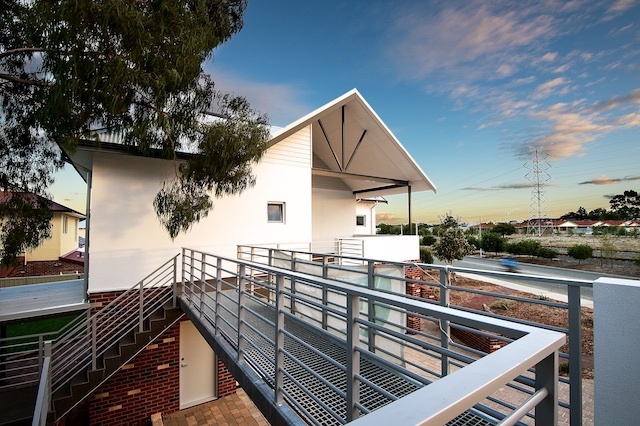 Unit 1 & 2 – Townhouse: Very generous living over three floors. On the ground floor are an open plan kitchen/living/dining area accessed from a generous entry. There also is a separate powder room on the ground floor. On the first floor are two double size bedrooms plus a separate sitting area or study. The large attic has been fitted out as a third bedroom. 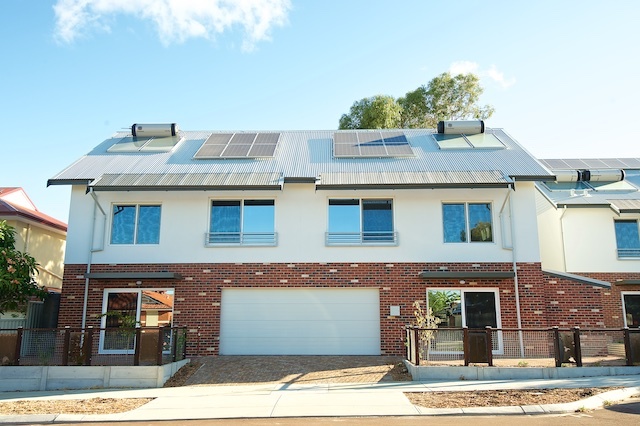 The home also comes with a 1.5kW PV system to help reduce your electricity bills. You have a private courtyard, but also enjoy easy access to the communal entertaining and garden areas. 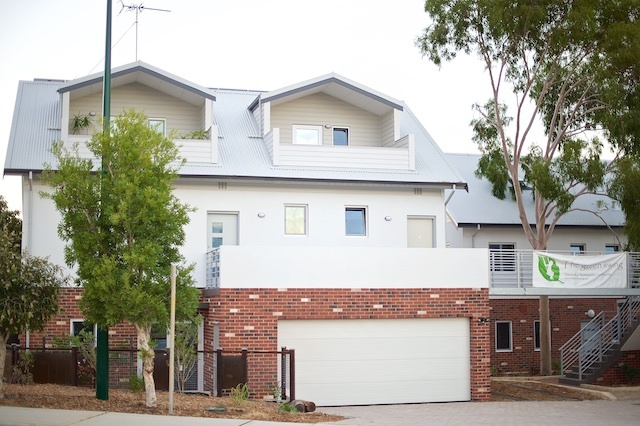 Each townhouse has one parking bay in the double garage and access to its own storage space. Unit 4 & 5 – 2-bedroom apartments with rooftop balcony. These two first floor apartments are small, but smart Living / dining area and a bedroom are on the first floor. From the loft area you have access to a private balcony. This loft area can be used as a lounge area, (guest) bed room or study. Total living area is 86sqm with 49sqm on the first floor and 37sqm in the loft.Storage and one secure parking bay in shared garages. 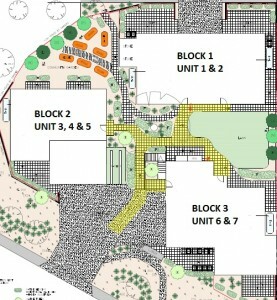 Unit 6 – Two bedroom apartment on ground floor. This ground floor apartment has a generous living area and two double size bedrooms. Total living area is around 73sqm. The apartment has been designed with universal access principles in mind. You have a large private courtyard on the south (33sqm) as well as direct access to the communal garden areas. One secure parking bay in shared double garage and your own storage area. Unit 7 – Three bedroom apartment PLUS self contained studio. We love this one and believe there simply is nothing like it! This first floor apartment is ground breaking; it offers real flexibility with its so called 2-in-1 type housing; it incorporates a separate self-contained studio. This apartment would suit an extended family, accommodation for a teenager, home office or simply offer the opportunity for increased affordability by the possibility of generate additional income. The main unit consists of open plan kitchen/living/dining. There are two double size bedrooms and a bathroom on this same floor level. The third bedroom is located in the finished loft accessible via a fixed staircase. The self contained studio has its own kitchen and bathroom – in total around 200m2 of living space! The private balcony provides room for solitude and privacy when desired and creates a great space for entertaining. One secure parking bay in shared double garage and your own storage area. We designed and built these homes to provide more people with the opportunity of living in quality and comfortable homes and be part of a healthy and happy community. Please contact us for more information.